The U. N. Special Rapporteur on torture and other cruel, inhuman or degrading treatment or punishment, Juan Méndez, has formally accused the U.S. government of harsh treatment of Bradley Manning that may amount to torture. Juan Mendez has completed a 14-month investigation into the treatment of Manning since the soldier's arrest at a US military base in May 2010. He concludes that the US military was at least culpable of cruel and inhumane treatment in keeping Manning locked up alone for 23 hours a day over an 11-month period in conditions that he also found might have constituted torture. "The special rapporteur concludes that imposing seriously punitive conditions of detention on someone who has not been found guilty of any crime is a violation of his right to physical and psychological integrity as well as of his presumption of innocence," Mendez writes. The findings of cruel and inhuman treatment are published as an addendum to the special rapporteur's report to the UN general assembly on the promotion and protection of human rights. They are likely to reignite criticism of the US government's harsh treatment of Manning ahead of his court martial later this year. Article 7 of the International Covenant on Civil and Political Rights states: "No one shall be subjected to torture or to cruel, inhuman or degrading treatment or punishment" while Article 1 of the U.N. Convention against Torture states in part: "torture means any act by which severe pain or suffering, whether physical or mental, is intentionally inflicted on a person for such purposes as obtaining from him or a third person information or a confession, punishing him for an act he or a third person has committed or is suspected of having committed, or intimidating or coercing him or a third person, or for any reason based on discrimination of any kind, when such pain or suffering is inflicted by or at the instigation of or with the consent or acquiescence of a public official or other person acting in an official capacity. " "I conclude that the 11 months under conditions of solitary confinement (regardless of the name given to his regime by the prison authorities) constitutes at a minimum cruel, inhuman and degrading treatment in violation of article 16 of the convention against torture. If the effects in regards to pain and suffering inflicted on Manning were more severe, they could constitute torture." [Mendez] also said that the US government had tried to justify Manning's solitary confinement by calling it "prevention of harm watch". Yet the military had offered no details as to what actual harm was being prevented. Mendez told the Guardian that he could not reach a definitive conclusion on whether Manning had been tortured because he has consistently been denied permission by the US military to interview the prisoner under acceptable circumstances. 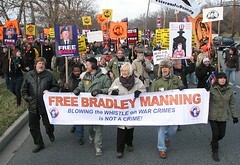 The Pentagon has refused to allow Mendez to see Manning in private, insisting that all conversations must be monitored. "You should have no expectation of privacy in your communications with Private Manning," the Pentagon wrote. The lack of privacy is a violation of human rights procedures, the UN says, and considered unacceptable by the UN special rapporteur.